July 20, 2019 will mark the 50th anniversary of the Apollo 11 Moon landing. One Giant Leap: North Carolina and the Space Race will be a 1,500 square foot lobby exhibit that explores North Carolina's role in the space race, containing stories about the people, places, chimps, and things that helped make America's historic leap to the Moon. Visitors can try out the Gemini training module from Morehead Planetarium or test their ability to follow directions at Mission Control during a critical phase in the Apollo 11 mission. One Giant Leap: North Carolina and the Space Race is part of Lift Off NC: Apollo+Beyond—a yearlong celebration that marks 50 years since the first human stepped on the moon. LiftOffNC includes festivals, exhibits, lunar- and star-gazing parties, feature films and documentaries, model rockets, space camps, astronomy days, musical performances, and more from all around the Triangle. Follow events at LiftOffNC.org or #LiftOffNC. Local organizations collaborating on Lift Off NC include the North Carolina Museum of History, Marbles Kids Museum, Morehead Planetarium & Science Center, the Museum of Life and Science, the North Carolina Museum of Natural Sciences, NASA / North Carolina Space Grant, and the North Carolina Symphony. 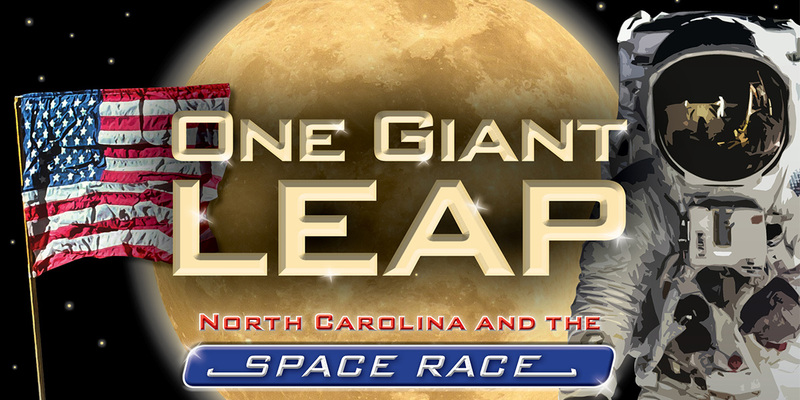 CBS 17 is the official media sponsor of the exhibit, One Giant Leap: North Carolina and the Space Race.